Sun City Texas is located in Georgetown, Texas, just 35 miles north of Austin, TX. 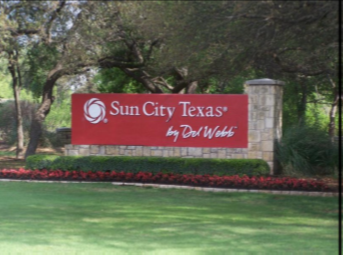 Sun City Texas is one of several Sun City communities started by Del Webb. Sun City is an age restricted community where on of the residents must be 55 years of age. Sun City is ideal for the “active adult” who enjoys playing tennis, golf, dance, yoga exercise or will numerous activities and clubs that are available. Some amenities of Sun City include a large central activity center, hobby facilities, numerous pools, lake for fishing, and many other facilities. Also, there are 14 miles of nature walks and ecological features on the site. For you golfers, there are three golf course that will keep your game up to par. The Sun City Community are very proud of the accomplishments in 2018 that will only unhand community experience. These include Mulligan’s Remodel & Re-Opening, Library Remodel and Grand Opening, Hidden Ravine Trail Grand Opening, Woodshop Expansion, Enhancements to the Horseshoe, washer and shuffleboard courts, and the Cowan Creek Pro Shop Expansion. The city of Georgetown is located 27 miles north of Austin, Texas and is known for its downtown Town Square which is home to many local businesses and popular festivals & events throughout the year (Georgetown Festivals & Events). Georgetown ranked fifth fastest growing U.S. city in the 2016 United States Census Bureau report and grew at a rate of 5.5% from 2015 to 2016. Along the San Gabriel River, you will find nearly nine miles of Hike & Bike Trails. Established in 1840, the oldest university in Texas, Southwestern University, finds it’s home in Georgetown. Sun City Texas by Del Webb builds 10 different home designs, ranging from 2-4 bedrooms, 2-4 bathrooms and standard 2 car garage. Currently, re-sale properties on average are 2 bedrooms/2 baths, 1,987 sq. ft. with prices averaging $168 per sq. ft. Please check Sun City Home Listings for updated listings. Sun City provides a wonderful living experience for the active adult. This proud community offers the charm of small town living and it’s just minutes from the culture and excitement of Austin. Sun City’s location provides affordable cost of living, great tax advantages and fantastic climate year round.